A lot of people are asking me about my travel essentials. Things I always take with me, no matter what. 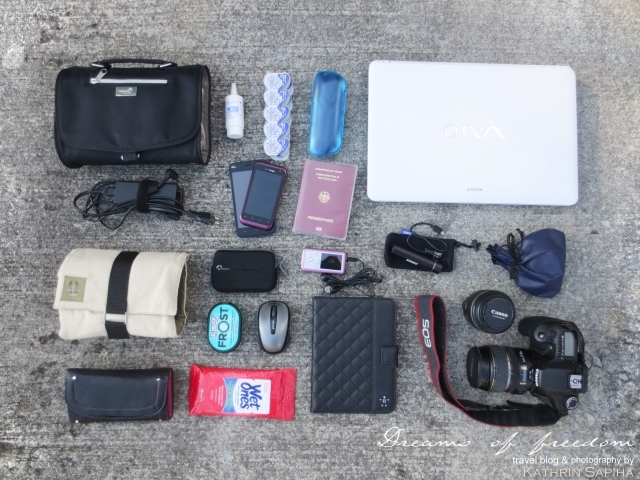 Here are my top travel items, that I would not leave the house without, when going on a trip. A love story that began in Paris. I was on my way from Berlin, Germany to Marseille, France. During a layover in Paris I walked to the gate to catch my next flight. Unless I need a gift or someone asked me to bring them something, I rarely ever shop duty-free anymore (simplify! ), so I usually pass the stores and don’t even walk in. But I looked to the left and there it was: This shiny little fella in off white! I had my personal “It’s so fluffy!” moment! Of course what I saw wasn’t fluffy at all. It was heavenly light and just what I was looking for for such a long time. It was the “Firelite Spinner” by Samsonite! I wasn’t able to take it home quite yet but was lucky enough to get one sent to me by Samsonite about half a year later. I am so thankful and enjoy every traveling minute with my new little friend here. It keeps my travel essentials safe, fit’s perfectly in the overhead compartment and is super stylish! 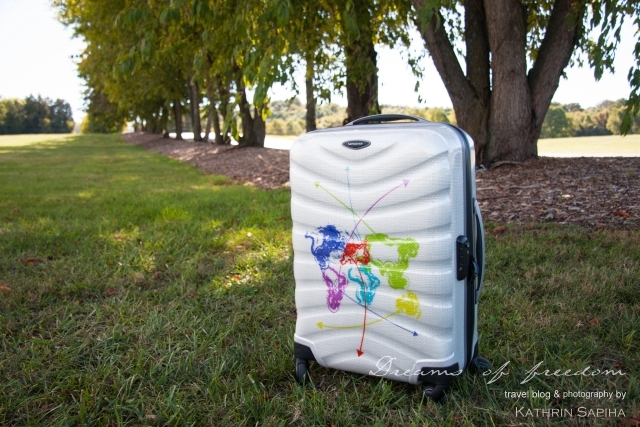 The world map design was created by Hannah Küppers from Germany and is the 2013 winner of the Design My Samsonite contest. Now I’m all Samsonite with my luggage. I always went for this brand for my check in luggage – even my toiletry kit is a Samsonite (and I think I have it for almost 10 years now) – but the Firelite Spinner is the cherry on top! Not only the perfect partner for every travel writer but everyone who has to travel for work. Most of all though it is for all those restless souls that simply travel the world because they LOVE it! Disclaimer: Some of the links below are affiliate links. However I would never recommend a product or company that I don’t trust. So I hope you will find all the information I am giving you helpful. The perfect camera doesn’t matter as much as the love for photography! Later on, when I bought my first SLR, I found myself expressing that love with Canon. That was way before digital photography came along. I’m sad to this day, that I sold this camera later on because I thought I’d never use film again. My current camera I have for about 6 years now and it never let me down. It is the Canon EOS 40D. I went to Malaysia with it, China, South Africa and many other places. My other tool to capture what I see along the way, is my Canon IXUS 125 HS (I believe in the US it’s called PowerShot ELPH) and not only do I travel with it but I never leave the house without it. Alway in my purse, always ready to preserve the moment. The main reason why I decided to get this one, was because it doesn’t only take nice photos, but I also can shoot Full HD videos with it. The first laptop I ever bought was a Vaio, in between I had a no-name brand and had trouble with it all the time. I’m not saying that this has to happen but I wanted to be on the safe side and eventually I went back to Sony. Within the past years I learned that quality matters, especially when you are traveling! Try and work with a broken computer in a Safari Lodge in South Africa! No way to rush to the store or have it fixed. Of course anything can break but that certain level of quality makes me believe things will last a little longer and my experience shows that it’s true. That’s a little bit of an annoying part for me, since I’d rather only travel with one phone. I still have my old regular cell phone from Germany. I kept the contract because I’ve had the number since I was about 18. Being a little bit sentimental. Here in the US I have a 2 years old HTC from Verizon, which is way too slow to stay with me much longer (loved it though, as long as it lasted!). I got a new phone from the French company Wiko. For travelers it is perfect, since you can leave your regular Sim card in and add an additional Sim card, that you might purchase in whatever country you are visiting. A brilliant idea, just not feasible in the US with my current contract. They just don’t offer Sim cards for unbranded phones. Still on the search for a perfect solution in that area. I got this little helper before I went to South Africa. I knew I would spend a night in a Zulu Village without any electricity and wanted to stay connected to the outside world. I picked a charger by Anker, which has the size of a small flash light. It charges my phone up to 2.5 times and I don’t only have it with me during my travels but also carry it in my purse on a regular basis, just to be on the safe side. Not only for my phone but also for the laptop and camera batteries I always carry the charging cables with me. I most certainly won’t need them during the trip but if you ever lost your luggage you know there are things you don’t want to miss during the first few days of your trip or – if worse comes to worse – that you would have to repurchase. You can’t get that special charger for your kind of camera as easy as a toothbrush or some new underwear. Before visiting another country, you should find out whether your electronic devices will fit into the power outlet. Most certainly they won’t, so be prepared to have the right adapter at hand and also make sure it converts the voltage for you if needed. When I came from Europe to the US, all I needed was the converter itself but if you would travel from America to over the Atlantic Ocean you don’t want your laptop or other devices fried by the higher voltage. For example the US has 110 V, in Germany it’s 230 V.
No trip without my Kindle! The best gift my man could have ever made me! Even at home I am using it every day. I thought if I ever buy an ebook reader it would be the Kindle Paperwhite, because it is so light and glare-free but there are so much more pros on the side of the Kindle Fire HD. I’m reading a lot but sometimes I just want to relax and watch a nice movie. I can crawl into bed and pick a nice movie on Netflix and enjoy some time off. If you are a guy, you will (most certainly) not need that! I have it in my carry on. Won’t get into detail about the products I’m using, but if you are interested, leave me a comment and I will get to that in a separate blog post. I don’t think there is much to say to that. Always keep things like those in your hand luggage. If you have a perfect vision, congratulations! Eye drops however might still be of use for you on a plane. The dry air can really give you the feeling like you walked though a sand storm with open eyes! Same goes for any sort of medication you may need during your trip. Not only could you need it during the flight/drive, but you also want to have it handy, in case your luggage get’s lost. Of course traveling without a passport is a no-go! You will need money as well and make sure, you are traveling with the right currency in your pocket. You can always exchange money, once you arrive but sometimes you could be in a rush and there won’t be much time. Also bring your credit card and find out the rates they charge for using it in another country. Sometimes it will be cheaper to get cash at the next ATM, other than exchanging it directly. Compare the rates ahead of time! Some of the items mentioned above I keep in my carry on, a few go into my purse so I am able to reach them faster. Boarding tickets, passport, antibacterial wipes (YES, you will need them! ), mints, a toothbrush, money and my MP3-Player always stay where I can access them quickly. I am curious. What are your top 3 (or more) items you take with you on every trip? Leave me a comment below! Carry OnDesign My SamsoniteHand luggageSamsonitetravel equipmentWhat's in my Carry On? Art is everywhere! Can you see it? Snap and win! Destination so that if my suitcase gets lost I can always still hit up the beach! Also I prefer real books to kindles. I know they are heavier but I love them! Kindle App on my iPad … You don’t have to wait for delivery and then have to stash the book somewhere to eventually get mouldy. I am seriously thinking of a little samsonite as I get on planes with camera, gifts etc like a packhorse. Need to be ruthless. My Canon 5D MK111 goes with me everywhere. Yes it’s heavy with the lens but I may miss something. My father lives in Fiji so I am always taking photos of the children. I can’t wait to shoot in the Middle East, Morocco, India! I’ve only just bought a flash for gods sake. I have so much to learn but for someone who doesn’t know that much but has a good eye I’m doing ok.